Why Taling Chan ( Floating Market) is special ? What began in 1987 as a handful of bamboo rafts has prospered into a floating market made of 11 metal pontoons paired with a walking street that the local Thai people residing in the surrounding streets and canals have grown to rely on for their larger weekend hauls. In the midst of all of the action, huge catfish circle the waters of the Taling Chan Floating Market and wait for anything to be dropped, whether purposefully or accidentally. If fueling a feeding frenzy is on your list of things to do, fish food can be purchased for 10 to 20 baht a bag. The Taling Chan Floating Market consists of both old and young Thai merchants that have set up shop in hopes of peddling their specialty goods and snacks from their long wooden boats. What to explore at Taling Chan ( Floating Market)? The floating vendors display their boats with their colorful ingredients, cooking gear, and servings utensils for all to see. The visual display of goodies makes it a unique experience. The food is cheap, quick, and typically ranges from 30 to 60 baht ($1-$2). 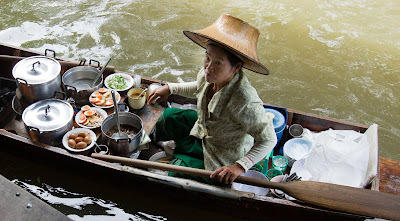 In other words, don’t be afraid to skip breakfast or lunch and attempt to eat your way through the Taling Chan Floating Market. Savory snacks are made to order, freshly plucked from a charcoal grill and served on a banana leaf or on the end of a stick. Grilled meats of all sorts are very popular with Thai people, and we personally find it difficult to deny some good old-fashioned meat-on-a-stick. Stay in Thailand longer than a day or two and you will undoubtedly hear passionate arguments about which type of street food is best. Although this particular market originates in the water with the small boat vendors, it soon transitions into a smattering of small shops along the dock. Walk a little further and you will find that it spills onto the nearby covered street where vendors sell various types of fresh produce from the local orchards. You will be sure to find native seasonal fruits and vegetables stacked high through the walking street area of the Taling Chan Market. If you aren’t sure what something is, most vendors are happy to give you a free taste before you commit to buying a large quantity of the exotic treats. We happen to love just about every fruit we have come across so far…even the much feared durian fruit! Shopping for your fresh produce at a place like the Taling Chan Floating Market rather than one of the big name box stores like Tesco Lotus or Big C will save you cash, and the freshness is usually a step above as well. As you enter the final length of the market, you’ll find a selection of beautiful flowers and shrubs available from the many green-thumbed merchants. Along the walking street portion of the market, some plants can even be bought for as cheap as 5 baht (about 15 cents US)! In addition to the wide variety of plants, you will also find everything you need to get your own garden project started. Bright, colorful, and unique planters can be had for a relatively small price. If you are a smooth talker, you should have no issues coming to an agreeable price for something you can’t leave without. Many merchants and mobile street vendors also sell fertilizer, small axes, rakes, and machetes on small wheeled carts at the very end of the market. 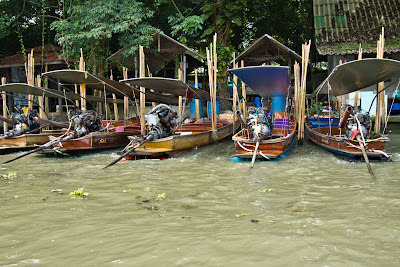 How to get to Taling Chan ( Floating Market)? Taxi is the easiest way but you can get on the BTS to Wongwian Yai Station then ride a taxi for about 17mn, or ride the bus for an hour following this map from Central World. It's more exciting when you visit this place during Songkran Festival. You can explore the market by yourself. No need to take boat tours because it can be expensive. The boats close to the market is more expensive and you can get one in another pier. Boat tours are available from 50 Bahts per person and 1000 Bahts for a boat (6 people). Located on the canal Khlong Chak Phra in front of the district office. Open only on weekends from about 8:30 to 15:00. 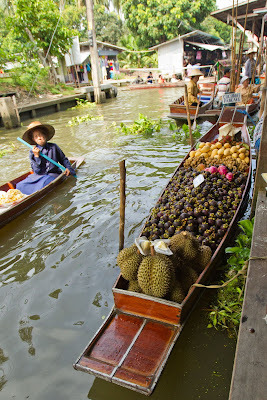 Orchard produce such as fruits, and vegetables and fish are sold from boats. 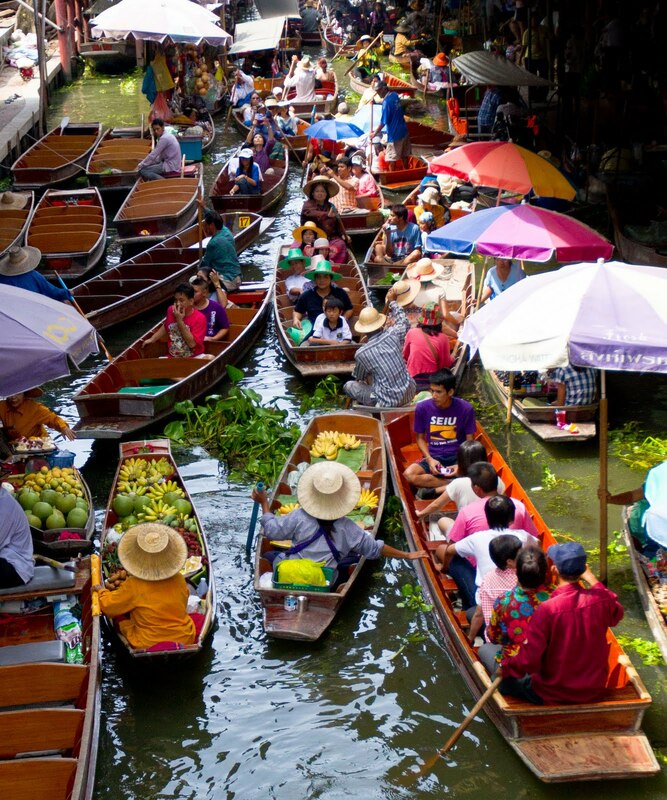 Taling Chan is my favorite “Floating” market in Bangkok. The floating portion is however not needed - I’ll discuss that late in this detailed review. If coming here with your own car, I highly recommend parking at and starting with the temple of the same name. This has a sign that reads Wat Talingchan Floating Market. Most will first see a parking lot a bit away, ignore this. When you get to the three way intersection that has the district office sign on right side, main market (with Red posts) straight head here you take a left and drive about 400m and the temple will be on the right. At the temple parking is free and there are attendants that direct cars. This has large Buddha’s available to give offerings too, but the big draw is an awesome food court which is all individual stands and pricing and the seating is right on the river with excellent views. The food has the low pricing found with typical Bangkok street food vendors. There is also live music here during the weekend market hours right in the area that you are enjoying a meal. While tourists occasionally stop, for the most part it is completely local Thai’s that populate this beautiful area. Once finished eating at other side of the temple opposite the food court is some shopping. Here amulets, toys, souvenirs, t-shirts, fruit, snacks, more food and much more. The pricing for all this is very good. Continue walking from there and you’ll find first some stairs that lead to a path with greyish color walls (photos attached). It looks a bit deserted but follow this for a short while turning right only where can then see the main road. This short walk will lead you very close to the actual market. You’ll however first be on a main road (take a left on to it, and then) 7-Eleven is to your right side and visible is the 3-way road with a sign indicating the District Office. When to that intersection, look left and the main market is visible. You can’t possibly miss it. The main market starts with many food vendors selling all types of fruit including my favorite durian, but of course many others too. Then as you progress you’ll find all your normal market type stuff for sale. A lot of it has prices marked. Comments that this is an overpriced market make me wonder if the reviewers have actually been here or not. For example branded Taling Chan Floating Market t-shirts are priced 120 baht for small sizes, 150 for others and 165 baht for extra-large, and I mean that is a normal Thai price and you can even negotiate a discount off that marked price with some bargaining skills. Everything else is priced to similar standards As you get deeper in the market you will reach the river. Here from the dock there is an opportunity to purchase food to feed the large cat-fish that populate it. There is also traditional Thai music, a Buddha, and a donation box. Food is sold along the far dock from vendors that are sitting in a boat, but there is no need to get on a boat to purchase from them, this can be done from the dock. From here the floating part is offered. You can take a large boat and board with many other guests. I guess some of the negatives come in that touts do sell foreigners an option to take a speed boat, and for this I would imagine there is a cost. I don’t know as I’ve never done that before. As for pricing for the floating part again, not sure. Thai people mostly shop in the massive land section where the floating part is just an added novelty. With eating at the temple, shopping the main market, taking time to feed fish, relax, enjoy views etc. Well over an hour passes easily at this place without doing anything touristy or even getting on a boat. All I’ve just mentioned is popular with local Thai visitors and the prices for everything is as such. 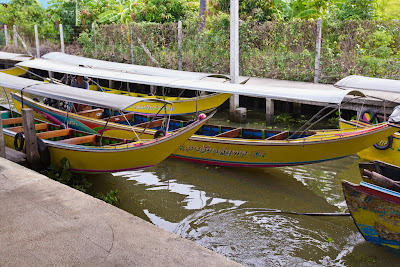 If you want to get on a boat and see something like the movies, you can do that here, but I’d suggest travel much further and go to Damnoen Saduak Floating Market which is the most famous one in Thailand. That’s another attraction I’ve reviewed on tripadvisor and provided some other suggestions what to combine it with. But if you want the Thai locals experience as I just described in this review at a neat market that is completely chill, non-aggressive, and friendly then for sure Wat (which means temple) Talingchan Floating Market combined with the actual market via the road leading to it and the docks is the way to go.